…His return ends months of agonising over his future. 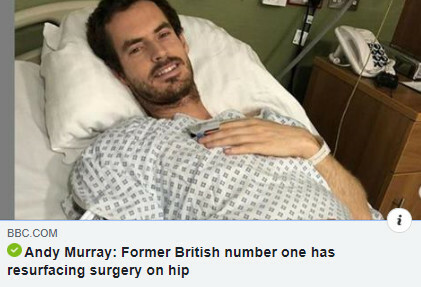 He was due to come back in Brisbane, before the Australian Open, but withdrew at the last minute and headed for Melbourne, where his trusted friend and renowned surgeon, John O’Donnell, performed the hip resurfacing operation, where a small sleeve is placed over the joint. December 4, 2017 – Fifth year still had some nice improvement (believe it or not). I’m saying hello on the eve of my ten year anniversary. In early 1998 there were fewer than 40 resurfacings in the U.S. and of course no surfacehippy group or knowledge base. My thanks to Keith and all you posters. An injury at age 24 started the journey toward this athlete’s BHR surgery 20 years later. I’m feeling so happy that today I reached my 14th Anniversary. I never though that I would reach that number. At the time of my surgery (I was 54 years old), I would have been pleased if my surface on surface hip replacement had lasted 5 years. Feb 2013 still going strong. No problems with my hip. 100%. More than six years post-op. Thank you Dr. Edwin Su at Hospital for Special Surgery in Manhattan! This archive footage shows badminton player Dave Eddy in action on the court. Dave has represented England over fifty times, winning a World Championship in the process and has bilateral Birmingham Hip Resurfacings (BHRs) which were both performed by Mr McMinn some fourteen years apart. Colin Gittins describes his experience of having a bilateral Birmingham Hip Resurfacing (BHR) operation. The keen football player is now back on the football field twice a week and also enjoys regular games of squash and circuit training. His procedure was performed by Mr McMinn in 2006.